You may not know it, but years ago I got most of Stig's Inferno up on the web. Just this week however, a fan scanned in the final issue and I have converted it into web pages. The fan also scanned the covers and supplemental stories from the issues, they will be put up later. So if you already enjoyed the other episodes journey now to Stig's Inferno #7. If you never looked go to The main Stig's Inferno page. You can also check out small versions of all the issue covers. I'll announce when the supplemental stories are added. The comic tells a variation of Dante's Inferno, where our hero Stig is killed by the creatures that live in his piano and makes a strange journey through the netherworld. It's funny stuff, and I'm not just saying it because he's my brother. Give it a read. In my college days, Ty was the famous Templeton I knew of. 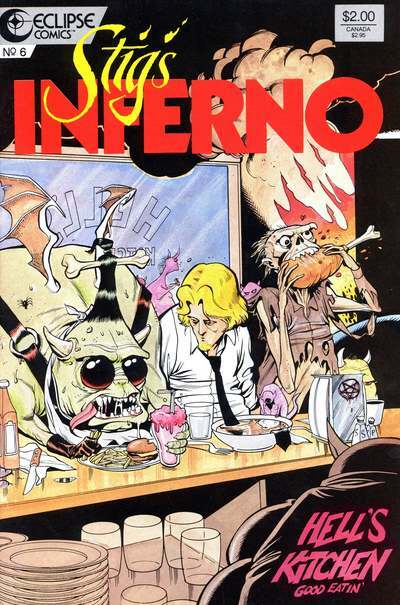 Stig's Inferno is one of the funniest thing I've read (up there with Hitchhiker's Guide). BTW, if there was stuff in the compilation that you're missing from the website I can probably dig it up. His art on the Batman Adventures mini-series is still my favorite version of Batman. I discovered Stig's Inferno when I was in high school and loved it. While the rest of my friends were getting caught up in Spawn or X-man or girls, I was busy reading Stig. I hope they reissue the comics. Better yet - forget the Avengers movie or a (heaven help us) a Daredevil sequel, make a Stig movie. Just try not to ruin it, please.